Time to gear up now , Flipkart is back with [Early Access to Flipkart plus members 31st oct 9PM] "Ab India hoga budget se mukt" buy original and latest products with great offers and discount in Flipkart The Big Billion Days . 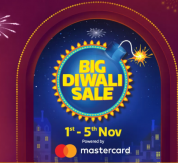 Flipkart.com brings you the Big Shopping Days, a 5 day mega sale on 10th to 14th October 2018 with amazing offers on even amazing products.Find massive discounts on the widest selection of mobiles, tablets, laptops, speakers, TVs, washing machines, refrigerators, clothing and footwear, make up, home decor, toys and books among other attractions. Celebrate Dhanteras and Diwali with us by shopping for precious jewellery, diyas and decorative lights at unbeatable prices. The festive season also calls for renovating your home. From TV units, colourful bedsheets, sofa sets, mattresses, kitchen range to dining tables, you will find everything you need to upgrade your home without burning a hole in your pocket. What should you expect? New deals every 8 hours and rush hours comprising of extra discounts for the first two hours. Choose from our multiple easy payment options such as 10% instant discounts on SBI Bank credit/debit cards, EMI on debit cards and no cost EMI for an easy and quick shopping experience. How to Buy amazing products from Flipkart in Flipkart Big Diwali Sale?